Holidays in Cebu just got a bit more interesting as Islands Sinulog Square, the latest tourism destination, situated on Magallanes Street in Cebu City, expects to become a brand-new focal point for several tourism connected projects in addition to the starting spot of an incomparable new type of walking tour. Islands Sinulog Square and the areas in close proximity have the ability to be the latest tourist spot in cebu according to Jay Aldeguer, president and CEO of The Island Group of Companies. He also observed that on a daily basis, about 30 buses bring tourists to Magallanes Street. “Sinulog Square, in addition to other museums in the area, could make a desirable heritage zone within the city if promoted properly,” Aldeguer mentioned. Located on a one thousand square meter property along Magallanes Street, Island Sinulog Square is the latest project of The Islands Group. The company’s largest original store in the Philippines, Island Souvenirs, occupies six hundred square meters of the new development. Sinulog Square is the latest add-on to a number of active heritage locations in Cebu which include, Cebu Cathedral, Basilica del Sto. Nino, USP Rizaliana Museum, Cebu City Hall, Sandiego Ancestral House, and Casa Gorordo. “Sinulog Square” was named in honor of the Sinulog Festival, one of the Philippines largest festivals, held in Cebu every January in celebration of Sto. Nino. Aldeguer stated “We really hope to drive tourism in this area of the city. Sinulog Square has the potential to offer visitors a new destination for holidays in Cebu, which is what is needed. 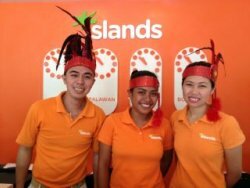 All products and services that a tourist might need will be available at Islands Sinulog Square. Additionally, the building will contain a Pasalubong Center, or gift shop, featuring delicacies from Cebu; dried mangoes, Titay’s rosquillos, and Shamrock otap to name a few. The facility will have the 3rd branch of the 45-room Islands Stay Hotels, a ticketing booth, and a currency exchange booth. On the weekends Sinulog dancers will perform throughout the year for the enjoyment of visitors. Since it wants to become the jumping-off point for holidays in Cebu in addition to having a unique walking tour concept, Aldeguer said, the Sinulog Square will also exhibit this month Sto. Nino images from Val Sandiego’s private collection.